The nun, badly needing to use the restroom, walked into a local Hooters. The place was hopping with music and loud conversation, and every once in a while the lights would turn off. Each time this happens, the place would erupt into cheers. However, when the revelers saw the nun, the room went dead silent. She walked up to the bartender, and asked, “May I please use the restroom?” The bartender replied, “OK, but I should warn you that there is a statue of a naked man in there wearing only a fig leaf.” “Well, in that case, I’ll just look the other way,”said the nun. 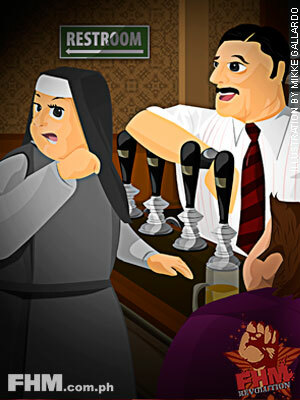 So the bartender showed the nun to the back of the restaurant. After a few minutes, she came back out, and the whole place stopped just long enough to give the nun a loud round of applause.